We have released the first episode of the new bi-monthly (fortnightly) exclusive Seeking Alpha podcast! This podcast is the first to be exclusive to Seeking Alpha ever so, please check it out and let me know your thoughts. Interview with Seeking Alpha Contributor Yale Brock on his long pick The Cheese Cake Factory. Roundtable discussion on the upcoming Federal Reserve meeting and the implications of a rise in interest rates. Featuring Seeking Alpha Contributors Yale Bock, Richard Berger, and host Russell Katz. The fourth episode (part one) of the first podcast exclusive to Seeking Alpha: Chasing the Elephant. Interview with Seeking Alpha Contributor Eric Parnell discussing his analysis of Amazon. Roundtable discussion on Amazon as an investment and the high multiples some companies are currently enjoying and the risks those entail. Featuring Seeking Alpha Contributors Russell Katz (host), Richard Berger, Yale Bock, and Eric Parnell. As the world changes, so do investment opportunities along with it. What once was abundant and boring is suddenly the catalyst of wars. As investors, it is our duty to be constantly vigilant and willing to change our entire investing strategy if the need arises. I reached this moment of clarity when the price of oil first collapsed. As someone who mostly covered oil and natural gas exploration, I decided to become more opportunistic and stop looking for ideas that kept me living under a rock (first and last shale joke). This led me to come across information regarding the drastic changes our planet faces and may soon consider the new normal. The most startling figure I found was an estimate by the 2030 Water Resource Group, an organization quoted by the UN and other key research publications, that by 2030 the world will be facing a 40% global water deficit unless there is either a drastic increase in supply or a severe decrease in demand. Neither of these scenarios are likely to occur as the vast majority of the world’s water supply comes from rain reliant systems such as rivers, reservoirs, and groundwater systems. Population growth, on the other hand, has eliminated the possibility of any demand decrease. The once effortless and cheap water supply has been stretched to the breaking point forcing countries to consider alternatives. The Dow ended the day up 183.67 points or approximately 0.90%. The S&P 500 ended the day up 20.06 points or approximately 0.86%. The NASDAQ ended the day up 51.64 points or approximately 0.89%. Oil ended the day down $0.53 at $52.65 a barrel. The Dow ended the day down 138.61 points or approximately -0.67%. The S&P 500 ended the day down 15.98 points or approximately -0.68%. The NASDAQ ended the day down 31.01 points or approximately -0.53%. Oil ended the day up $0.07 at $52.91 a barrel. *The above article is paid content however, I do believe the information is important and relevant enough to include. I am not being compensated for recommending this article. I had to post this update from my phone due to being in the airport so please pardon the grammar. 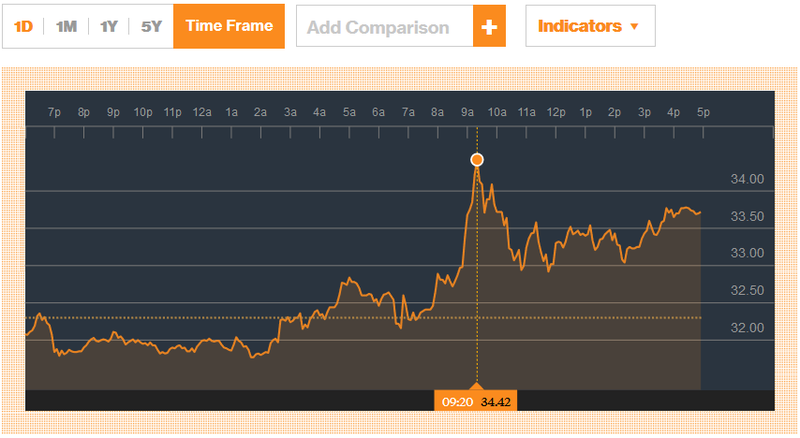 Oil prices climbed over 8% today due to the inverse relationship with the United States dollar. The US dollar slid towards the end of the trading day. Keep in mind that oil inventories climbed by 7.79 million last week to the highest US inventory glut since 1930. The Dow ended the day up 396.66 points or approximately 2.47%. The S&P 500 ended the day up 46.88 points or approximately 2.48%. The NASDAQ ended the day up 207.28 points or approximately 2.38%. Oil ended the day up $0.52 at $33.74 a barrel. Gold ended the day up $0.30 at $1,118.40. The Dow ended the day up 125.18 points or approximately 0.79%. The S&P 500 ended the day up 10.41 points or approximately 0.55%. The NASDAQ ended the day up 38.51 points or approximately 0.86%. Oil ended the day up $0.92 at $33.22 a barrel. Gold ended the day down $0.20 at $1,114.70. Iran’s President recently signed an outline order with Airbus Group for a total of 118 jetliners as well as an accord with PSA Peugeot Citroen regarding the modernization of a car plant in Tehran. The total price tag, according to Bloomberg calculations, was approximately $33 billion. Iran’s central bank estimates that the lifting of international sanctions will result in approximately $50 billion a year in foreign investments. I know I have not touched on private equity and I do not plan on. However, this is a concise overview of private equity in a way that ties into the publicly traded stock market. Definitely worth a read. To start off my first write-up, I will cover one of the most common and basic asset class, Equity in the early stage, Private Equity. The most common and basic investment asset class is Equity. Equity is being valued since the formation of a company. Private Equity as an industry, invests and grows private and unlisted companies. Because of today’s environment and ease of creating a new business idea and company, the term “startup” today describes new businesses that have begun its operations. On top of this, there are claims that the new business ideas have to be innovative and new in any industry. However, companies have been built from scratch and grown over hundreds of years, where the big names are sitting on today’s stock exchanges.